I've started this message four times now, each time with a different intention — putting this blog on hiatus, quitting everything, rebooting life, running away — just to say something, or to say why I haven't said anything, to to rail against the need to say anything. I'm not doing well. I feel an acute lack of time, energy, and creativity. It's no help as I'm heading into the most intense time of the year at work, with demands for daily manic creativity. And now, I'm going to tell you something strange about myself. ...which isn't a bad song, not by any stretch of the imagination. (Video here, if you're curious.) It's just played in a way that sounds like a deep breath of longing, and restoration that is so desperately needed. And it is. * It's been 25 years since I've heard this, any my mind has simplified it a bit by deleting a few verses. If you can stand the sound of a 1985 camcorder ported to YouTube, you can get an idea of what the song sounded like here. What I find remarkable is the unbidden nature of it, its consistency, and the fact that it's usually just what I need. And what I need, apparently, is to be drawn back to Jesus — who is this King of Glory, pursuing me with His love. 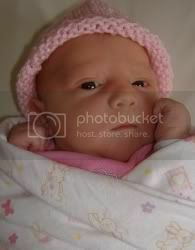 Talia Naomi Gove, born August 19, 2009. 6 lbs., 8 oz., 18", and my first niece to go along with my seven nephews. I guess that makes me 12.5% more avuncular! There's a lot to be said for New England, particularly its smallness. Doing something a few states over is quite a drive when you're out west; in New England, it's just a fact of daily living. So I figured that if I was going to be up here where the states were small, I might as well collect one that I'd never been to before: Maine. We left the rest of the family with my in-laws, and headed out for a nice romantic adventure, just Deborah and I, on the motorcycle. OK, so we were total tourists. We went up coastal Route 1. We saw lighthouses, even if they were just off in the distance. We ate lobster. We understood why people like lobster. We flirted with each other shamelessly. We got lost on the way home, but we found ourselves again.